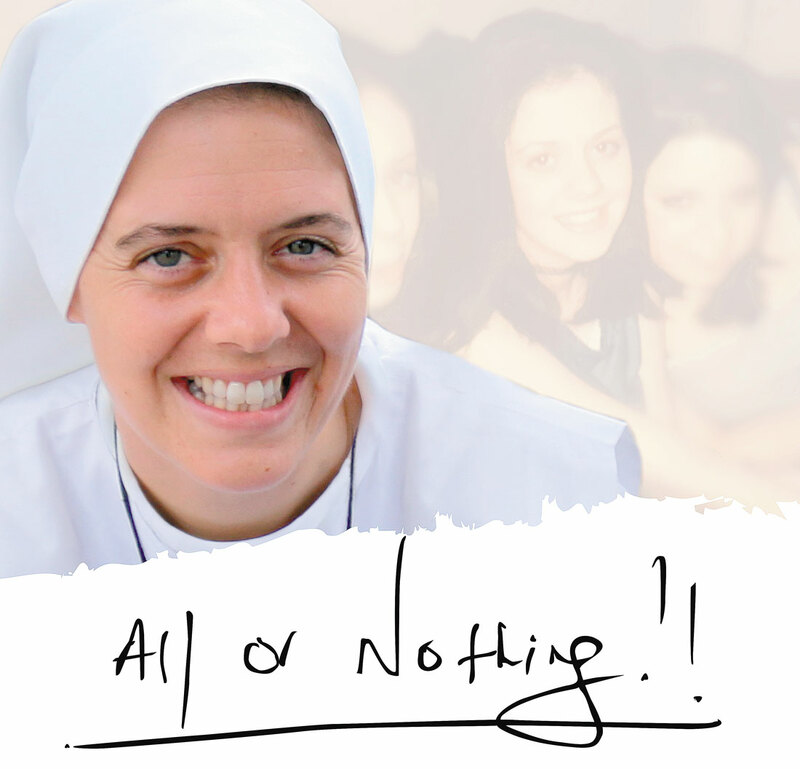 Sr. Clare Crockett’s motto, which she would write in letters to the children and teens with whom she worked, was “All or Nothing.” The film about her will be released on YouTube Nov. 14. There are moments of recognition for anyone watching “All or Nothing,” the documentary about Sister Clare Crockett, an Irish Servant Sister of the Home of the Mother. The realization begins as a musing thought that grows until most viewers — Catholic or not — understand that this is what a saint looks like. That, at any rate, was the audience’s experience at the Archdiocesan Pastoral Center in Portland last week. The group of about 40 saw a preview of the film that is to be released on YouTube and in a DVD on Nov. 14. “I was profoundly moved by her joy and humanity,” said Archbishop Alexander Sample. He explained that sometimes we overcomplicate the core of our faith, which is to love Jesus in the Eucharist and to love our holy Mother. Sister Clare was born in Derry, Northern Ireland, in 1982, during The Troubles. Derry was a hot point in the guerilla war there that debased the lives of many young people who witnessed the partisan-stoked hatred that played out in bombings, assassinations and militarized policing. “There was no room for God in a society dominated by hatred,” she wrote. Amidst that backdrop, young Clare Crockett just wanted to be famous. She had the looks, the confidence and a comic’s timing that landed her as a host on a television show. She had an agent and a part in a film. But when a free trip to Spain presented itself, she went, thinking she would party on the beaches of Ibiza. Sister Clare put her immense gifts to work for Jesus and Mary, gifts that were not only comedic and musical but an ebullience, grace and good humor that won over shy children and damaged teens alike. Many of those children and teens, notably from Florida and Ecuador, spoke about her in the film. Sister Clare liked to say that she was signing a blank check for the Lord every morning, agreeing to cheerfully do whatever was asked of her. Sister Clare was killed April 16, 2016, in an earthquake in Ecuador that flattened the four-story concrete-walled school where she taught. She was 33. She was singing with a group of students just before the earthquake struck. “She sang until she lost her voice; she gave everything,” one of her fellow sisters said of her. Two Servant Sisters who knew Sister Clare brought the film to the pastoral center: Sisters Grace Silao and Kelai Reno. Sister Kelai is from Newport. Oregon has another connection with the sisters: Todd Cooper’s stepdaughter, Elisabeth, joined the order five years ago. Cooper is director of special projects for the archbishop and serves on staff for the Oregon Catholic Conference. Sister Kelai said it was impossible to put into words Sister Clare’s generosity of spirit. Few outside the order, for instance, knew that she suffered migraines so debilitating that at times she would have to leave the room to vomit every 15 minutes or so. She didn’t wait until she was better to get back to work, but came back immediately to whatever she was doing. The last time Sister Kelai saw her, she said Sister Clare’s holiness stood out. Since her death the sisters have been made aware of all the people who pray to Sister Clare. They are documenting spiritual and physical miracles associated with her, a young woman who turned her back on narcissism and fame to serve Christ. after watching and reading about Sr. Clare, I have begun daily prayer to her. The fact that my own Christian Catholic life has turned into more "listening" to God instead of bugging him for more and more as she taught. She's become my hero!!!! A pure soul that should be considered for Sainthood. This comment has been hidden due to low approval. I have looked at the film at least 20 times and I do indeed pray to her. She brings joy and love of God into my life. I bought the dvd. I intend to take it the the local Catholic High School. She will be called St Clare some day. By the way, I am almost 70 years old. What a blessing she is! This comment has been hidden due to low approval. I haven't met Sr Claire but came across her on YouTube and love her very very much. I pray to her for intercession and know that she is interceding for me and my family right now This comment has been hidden due to low approval. Sr. Clare u lived a life that was simple giving your best I pray for your intersession that the Lord may grant me the grace to do his will like you always did giving all of your self This comment has been hidden due to low approval. I have just watched the movie of Sister Claire and i have been touched by her and her holiness and desire to serve God. Ibelieve she will one day be a saint. Please if there are any prayers to her I would appreciate you letting me know. I feel she will a great intercessor for me. Thank you. This comment has been hidden due to low approval. I call her Sister Saint Clare, & pray to her daily. Everything she represents feeds my soul and I am counting on her to help me discern exactly how I am to live out my call to give my whole life to Jesus. In my prayers she stands with Mama Mary and St. Teresa of Calcutta, and Jesus. This comment has been hidden due to low approval. Beautiful conversion!!! She lives with God. Praying to her for youth and conversion of souls!!! This comment has been hidden due to low approval. I have started praying to Sr Clare for a special personal intention. May God Bless her and keep her so that she may intercede for us here. This comment has been hidden due to low approval. Having heard about a lovely prayer to Sr. Clare Theresa Crockett, I would be grateful if you could forward some to me so that I could give them to family and friends. Thank you. This comment has been hidden due to low approval. I truly feel this young lady will become a saint in my life time & as another person from Derry I feel so proud that the rest of the world has the opportunity to see the love & holiness that shines from this young girl This comment has been hidden due to low approval.